I can't recall ever seeing a discussion on the use of air rifles. This would seem a good fit in a gunpowder constrained environment. Something like an Ataman M2R Carbine Air Rifle, as a modern example, would seem to be fairly effective against unarmored opponents and game animals. The Girandoni air rifle was used in Europe in the late 18th and early 19th century. One draw back of the Girandoni was the hand pump took about 1500 strokes to repressurize the tank, though this was mitigated for military units by having a wagon mounted tank to recharge the rifle. In a Morrow setting, a trailer mounted wood or steam powered air compressor could accomplish the same task for a modern air rifle. The energy numbers I have for the Ataman M2R in various calibers is in foot pounds of energy (FPE) and I have not had an opportunity to calculate a conversion to EFactor to see how effective it would be in game terms. But on the surface a rifle that is very quiet, completely smokeless and making no flash would seem to be a good choice of weapon in guerrilla warfare. I know this is not specifically about air rifles but it's worth looking at the fighting in the Italian Alps during the First World War between the Austro-Hungarians and the Italians. There was heavy use of pneumatic mortars beginning with their first use by an Austrian infantry division. The smaller pneumatic mortars would arguably be as good a choice for guerilla actions as air rifles with the specific benefit of adding some firepower with a much reduced risk of detection when firing. And if you really want to delve into the topic, it's not surprising that the following website has a number of pages devoted to air powered mortars including homemade versions/conversions. I see an AirForce Talon SS, which can be had up to 0.25" bore, and feeds from a tank. A .49 liter tank can be filled from a compressor or by hand pump (not part of the rifle itself). It's powerful enough that a suppressor is available for it! At .25 caliber the top muzzle velocity is 665 feet per second. E-factor is 3. The Seneca Double Shot is a double-barrel gun, fed from a tank, and firing up to .50 caliber ammo. It uses a 0.24 liter tank which will give 5 shots of round balls at "up to 600 feet per second". E-factor is 6 for round ball. Benjamin 342 hand-pumped .22 pellet rifle. It holds ten .22" pellets in an internal magazine. The shooter has to pump the front end three to ten times between shots. 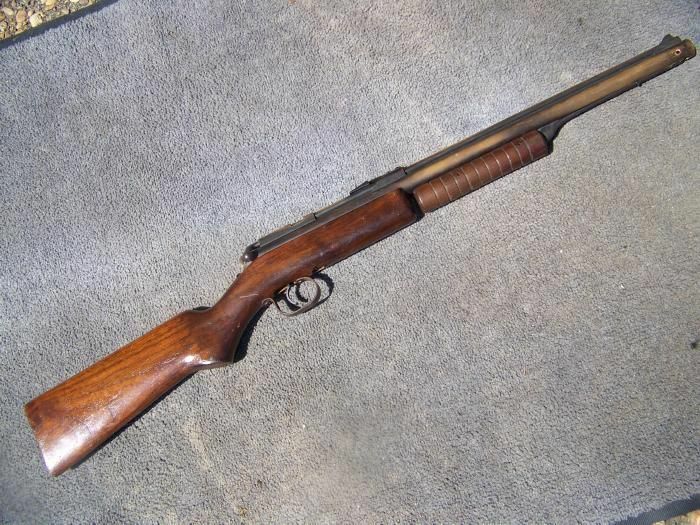 They have nice wooden stocks, brass receivers and barrels (under dark finish), and a barrel shroud that makes them look like ... well, less like a air gun, more like a .22 LR maybe. They need their internal rubber components replaced every few ... years, decades? Weight 3 kg. Muzzle velocity can easily be 550 feet per second. E-factor is 2. Since these numbers assume very good quality control and precision manufacturing processes, survivor variants may have lower EFactors. These numbers seem to be rather consistent with modern air rifles. Allegedly, this thing has a caliber of 0.46 inch and a muzzle velocity of 1000 feet per second. Are we looking at an E-factor or 9 or 10? Last edited by Matt W; 02-12-2019 at 10:57 AM.